Announcement Welcome to Aika Felt Works' studio near the Arctic Circle in Finland! 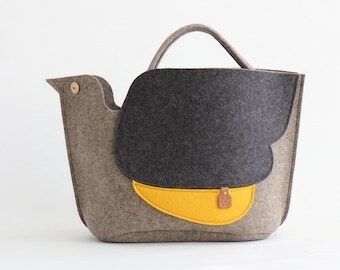 I create functional, eco-friendly wool felt works that will fill your heart & home warmly. The price includes Finnish VAT that doesn't apply to NON-EU customers. However, please be aware that NON-EU customers may be charged applicable customs taxes & duties when you are receiving products in your country. Please write your PHONE NUMBER in the "note to seller" field during the check-out that I need in order to ship your order (and I will not use it for any other purpose!). Thank you very much. *`•.¸(¯`•.•´¯)¸.•´ ♥ Thank you for shopping handmade!!! Welcome to Aika Felt Works' studio near the Arctic Circle in Finland! 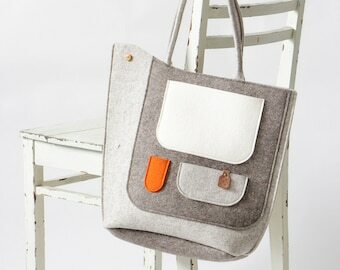 I create functional, eco-friendly wool felt works that will fill your heart & home warmly. Excellent experience. I would highly recommend. Aika’s design, craftsmanship, and packaging are superb! A high quality product and a perfect gift for my friend. Wool felt slippers have a new color, light gray & white insoles. Not sweaty but just comfortable! New! Ultimate felt work bag designed with a customer, focusing on high usability. If you are looking for an office bag which has a compartment suitable for your MacBook Pro 15inches, here it is! Still it's April, if you live in the US, Australia or Japan, today and tomorrow (18-19 April) is a chance to order Aika Felt Works' Knitting bag as a gift on Mother's Day (13 May) with standard shipping in time. No worry with early ordering! Various sizes of custom-made basket - waiting to be packed and shipped. Navy blue bird bag - cutting the felt, working with leather by hand. High quality pure wool felt products proudly made with craftsmanship for your satisfaction! 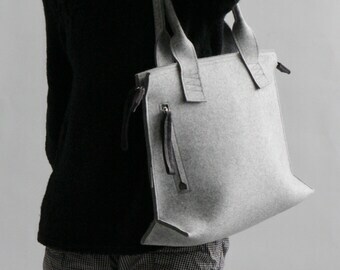 *`•.¸(¯`•.•´¯)¸.•´ ♥ I use natural material, wool felt that returns to the earth. When I ordered wool fiber for the first time for hand-felting, I found tiny hay twining around the fiber. This let me imagine a scenery where a sheep was walking on a vast and windy field, with this very fiber on its body, breathing and alive. Since then I am conscious that I am using the animal’s hair, a part of the nature. Now I import and use 100% wool industrial felt. It is produced in Germany by water powered electricity that has no CO2 emission. And natural wool is completely biodegradable so when my felt products end their lives, you can bury them in soil to richen its composition. I started sewing when I was 5 years old in my kindergarten. I was soon absorbed in handicrafts, and countless little dolls, bags and knitwear have been coloring my life. Also, making things helped me all the time to forget missing somebody important, to express myself in abroad to compensate my poor language skill, and to be confident with being myself. I love exciting feeling to see a work gradually being done, and love the nice tiredness after finishing a work. I believe that we were born to use our hands to make things. Today’s market allows you to buy cheap labor in somewhere far away. And what has happened is that we are losing our chances to use own hands and develop skills, and the beautiful moments in creation. I can’t really imagine my life without handicraft. It has been always close to me and I even rely on. That is why I make all my products in Rovaniemi, Finland with my friend, Maarit who is a professional sewer with long carrier. What we care about in production is quality: we care every section of cutting line, every single stitch we sew, because these are all important details determining the quality of my brand, and we are proud of our craftsmanship still alive here in Finland. I'm Japanese designer living in Finland. I love slow and crafty life. I have BA in environmental design, MA in industrial design. Working experience in furniture design studio. I have been absolved in handicrafts as long as I can remember. MEB-Design was founded in 1997 in Rovaniemi, Finland by Maarit Bergman who is an artisan, dressmaker, and teacher. She designs and makes outfits and decor for both private clients and companies from a variety of materials, from silk to leather. Welcome to Aika Felt Works Etsy shop! - Please contact me within 14 days of receiving it. I will refund your money less shipping charges upon return of the item in its original condition. This doesn't apply to made-to-order items. - Cancellations are possible before shipping is completed except for made-to-order items. I accept PayPal, credit cards, debit cards, direct check-out and Etsy gift cards. - I use Finnish Post or General Logistics Systems Finland Oy for all the shipments. - Please enter your PHONE NUMBER in the "Note to Seller" field during the check-out. I need your phone number for the shipping purpose only and I will not use it for any other purpose. Thank you very much for your understanding! - Item's delay of arrival occurs in the transportation from time to time which is unavoidable on my side. Please be patient to wait for another 5 business days after estimated arrival day, and let me know if you still don't receive your item. All items from Aika Felt Works are carefully packaged in new materials. Please be aware that any applicable customs taxes & duties are the responsibility of the recipient.